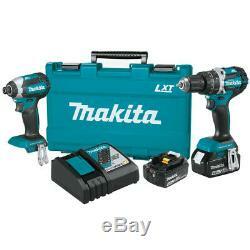 Makita XT269M 18V LXT LithiumIon Brushless Cordless 2Piece Combo Kit. Brand New in Original Packaging. Max torque in impact driver. Tools with soft, rubberized grip. LED battery charge level indicator. 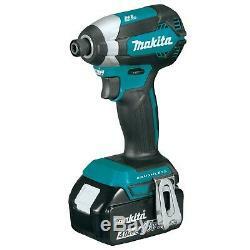 The Makita XT269M 18V LXT Lithium-Ion Cordless 2-Piece Combo Kit gives you a compact cordless hammer drill and cordless impact driver for a wide range of drilling, driving, and fastening applications. The versatile hammer driver-drill is ideal for use on wood, metal, and masonry. The powerful impact driver delivers an insane 1500 in. Of torque for more efficient drilling and driving. The Combo Kit also features 2 18V LXT Lithium-Ion 4.0Ah Batteries that will keep each of your tools running longer, along with the Rapid Optimum Charger so you can significantly cut down on your charging and waiting time. Makitas Star Protection Computer Controls allows your hammer drill to communicate between tool and battery in real time to better monitor conditions and protect against overloading, over-discharging, and overheating. An efficient BL brushless motor delivers 530 in. Of maximum torque in the Makita XPH12Z 18V LXT Compact Brushless 1/2 Hammer Driver-Drill to take on even the toughest of projects. A variable 2-speed design covers a wide range of drilling, driving, and hammering applications to ensure the job gets done quickly and correctly the first time. With a compact 7-1/8 design and rubberized soft grip, this driver-drill is built for increased comfort on the job so you can keep at it for hours. The Makita XDT13Z 18V LXT Brushless Impact Driver was built for a wide range of fastening applications. Variable speeds of 0-3, 400 RPM and 0-3, 600 IPM give you more options to complete more tasks than ever before. The BL brushless motor delivers 1500 in lbs of maximum torque to complete those harder, more powerful applications. At only 5 long, the compact and ergonomic design of the Makita impact driver mean you get more accomplished without tiring. A soft rubberized grip provides supreme comfort while in use. Each tool in the Makita XT269M 18V LXT Lithium-Ion Cordless 2-Piece Combo Kit is powered by the Makita BL1840B 18V LXT Lithium-Ion 4.0Ah Battery. The 4.0Ah battery charges incredibly fast in just under 40 minutes so you spend more time working and less time waiting. An integrated LED battery charge level indicator allows you to accurately monitor your tools battery level so you know how much time is left to get the job done. The lithium-ion battery resists self-discharge and remains ready for use even after long periods of inactivity so it is always ready to go. With Makitas LXT Lithium-Ion battery technology, you can unplug and experience new levels of convenience, efficiency, and productivity. The Rapid Optimum Charger has a built-in fan to cool the battery for faster and more efficient charging. Star Protection Computer Controls give you a smarter and more streamlined tool that actively communicates data with the battery to ensure the most efficient use of power. It protects you from potentially dangerous overloading, over-discharging, and overheating. What's in the Box. 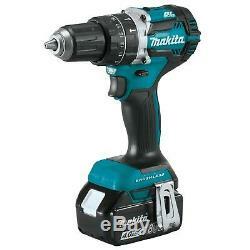 Makita XPH12Z 18V LXT Compact Brushless 1/2 Hammer Driver-Drill. 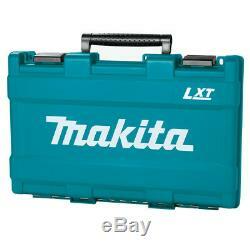 Makita XDT13Z 18V LXT Brushless Impact Driver. 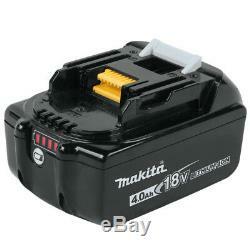 2 x Makita BL1840B 18V LXT Lithium-Ion 4.0Ah Battery. 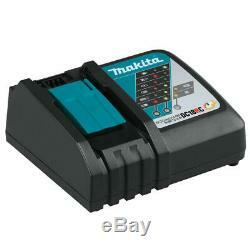 Makita DC18RC 18V LXT Lithium-Ion Rapid Optimum Charger. Battery Power Type: Lithium Ion. Cordless Tool Type: Combo Kit. Number of Batteries Included: 2. Number of Tools Included: 2. Tools Included: Hammer Driver Drill, Impact Driver. Tools Product Type: Power Tool. Items removed from their'blister-pack' display packaging are non-refundable. The item "Makita XT269M 18V LXT LithiumIon Brushless Cordless 2Piece Combo Kit" is in sale since Monday, November 19, 2018. This item is in the category "Home & Garden\Tools & Workshop Equipment\Power Tools\Power Tool Sets". The seller is "asavings" and is located in Brooklyn, New York. This item can be shipped to United States, Canada, United Kingdom, China, Mexico, Germany, Japan, France, Australia, Denmark, Romania, Slovakia, Bulgaria, Czech republic, Finland, Hungary, Latvia, Lithuania, Malta, Estonia, Greece, Portugal, Cyprus, Slovenia, Sweden, South Korea, Indonesia, Taiwan, South africa, Thailand, Belgium, Hong Kong, Ireland, Netherlands, Poland, Spain, Italy, Austria, Bahamas, Israel, New Zealand, Philippines, Singapore, Switzerland, Norway, Saudi arabia, Ukraine, United arab emirates, Qatar, Kuwait, Bahrain, Croatia, Malaysia, Chile, Colombia, Costa rica, Panama, Trinidad and tobago, Guatemala, Honduras, Jamaica, Viet nam.